On the recently completed road trip, the Dodgers scored 61 runs and had 115 hits in just 10 games. For the non-math majors out there, that’s 6.1 runs and 11.5 hits per game. Overall, the team hit .311 with a .370 OBP, which is hopefully a positive sign that they can start to turn this thing around while the pitching gets back on track at Dodger Stadium. Jamey Carroll hit .500 on the trip (15-for-30), Matt Kemp batted .472 with 7 homers and 16 RBI and Aaron Miles hit .438 (14-for-32) with several clutch hits. 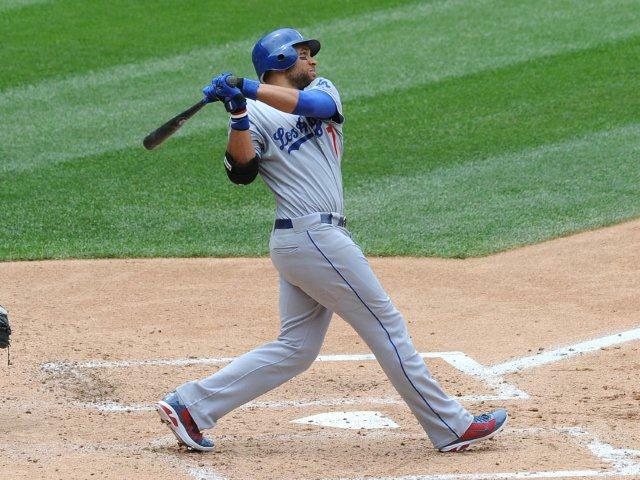 And of course, James Loney hit a key grand slam yesterday. Entering the road trip, the Dodgers had batted around in an inning four times and during the 10 games, they did it five times! The longest homestand of the season starts tonight – three games each against the Reds, Astros, Tigers and Angels. As Vin always says, hope you’ll make your plans to be part of it! Right around the first pitch of tonight’s game against the Phillies, the draft room on the eighth floor at Dodger Stadium will start buzzing as the Dodgers gear up to make their first selection, the 16th overall choice this year. You can watch it live on MLB Network or follow the unparallelled coverage at mlb.com, as Maury Wills and Dodger scout Rich De Lucia represent the team at the draft in New York. Last year, the Dodgers were the surprise of the first round, snagging Zach Lee with a pick late in the day though he was considered “unsignable.” With a bonus of more than $5 million, he joined the ranks of Dodger prospects which includes the last eight years worth of first-round pitchers (James Loney in 2002 was our last position player taken in the first round). A day like today (and the next few days) are the culmination of an insane amount of work by all of our scouts who traverse the country looking for the next great Dodger player. It could be a first-rounder like Clayton Kershaw or a sixth-rounder like Matt Kemp…or even later in the draft, as many success stories come from then, too. But these scouts are truly the backbone of the game of baseball and rarely get the credit they are due. So tune in tonight and give a shout out to the Dodger scouts and administrators who have made it their life’s work to find the next player you’ll root for at Dodger Stadium. The much anticipated announcement of the various caravan stops is now offiical, as we put out a news release this morning. All the information you need is here. We’ve actually got great response from the players and current team. Headlined by new skipper Don Mattingly, you’ll also see Rafael Furcal, Andre Ethier, Matt Kemp, James Loney, Tony Gwynn Jr., Jay Gibbons, Gabe Kapler along with a host of former Dodgers and current Dodger broadcasters. It’s two days of community service leading right up to the reporting date in Camelback Ranch, so hopefully you’ll find a way to lend a hand during some of the public community service stops and meet some of your favorite Dodger personalities. As you all may know by now, we’ve been doing theme nights with accompanying posters and we started with a 60s style rat-pack themed poster of the coaches. Well, Casey Blake and James Loney were great sports and we just shot their 70s photo about an hour ago. The giveaway night is on June 4 and you can get your tickets here. In fact, a handful of fans who happened to be buying Dodger tickets at the Top of the Park got a lucky sneak peek at the photo shoot we did with our corner infielders. And earlier this morning, the two American Idol finalists were hanging out on the field doing some interviews and sorts for the upcoming finale. I didn’t personally deal with them, but I’m told they were very gracious and that Lee DeWyze is a big baseball fan. So vote for him, I guess. I’ve never seen the show! It’s this sort of stuff that we’re going to try to post more often at Inside the Dodgers because quite frankly, I’d imagine this is more interesting than straight news about the team. Believe it or not, this blog predates Twitter (and Facebook, I believe), so just being the first to post the lineup isn’t what will keep you all intrigued, I don’t think. If there are things you’d like to see from the blog, please let us know, as it’s an ever-evolving site. But for those who really loved getting the lineups all the time, please make sure you follow the team on Twitter because that’s where it gets posted as soon as the coaches hang it in the clubhouse. And given that we’re not usually at a computer when we get the lineup, it’s a million times easier to just tweet it from our handhelds. By the time we get upstairs, the lineup is already spreading like wildfire through cyberspace. No, not the Padres…though as the first place team at the moment, they are kind of like the evil empire right now. We’re talking about tomorrow night’s promotion which I’m sure you’ve all heard about, but there’s a really funny Jib Jab video that utilizes a few of our players. The My Town section is completely sold out, there are still tickets left for other areas of the stadium, where fans will get the poster that you see at the same link. It’s actually pretty cool that what started as a simple request to use Yoda on our billboards has turned into a great relationship with the Lucas Films people (and the Yoda billboard actually won an advertising award). There are a lot of Dodger fans who like Star Wars and vice versa, so hopefully some of you fall into that category. It’s also sparked other similar relationships with the people at SpongeBob and Phineas and Ferb and for any of you with kids, you know how big those characters are with your little ones. Otherwise, just another busy day at the stadium. We actually had a news conference here for the Taiwan Tourism Bureau, where this guy performed a song. If you haven’t seen this yet, you’ll be amazed at his voice. He’s up to almost 7 million hits on youtube and he was extolling the virtues of visiting Taiwan, as were James Loney, Jamey Carroll, Xavier Paul and Hong-Chih Kuo. By the way, if you missed all the videos from our trip to Taiwan back in March, you can check them out here (keyword Taiwan). OK, that’s three video links in one blog post, which I think is probably a record for Inside the Dodgers. So, we’ll end the post now.